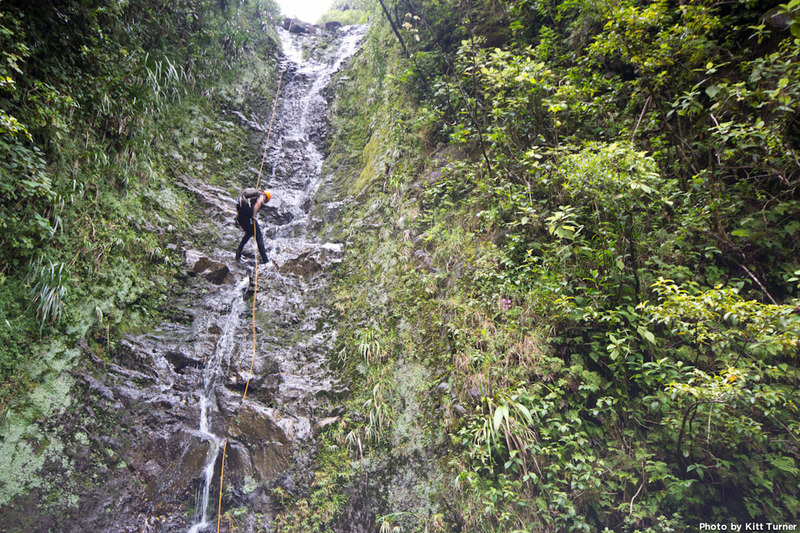 This is a rappel down a 70 ft waterfall somewhere on Oahu. WARNING: This is dangerous. 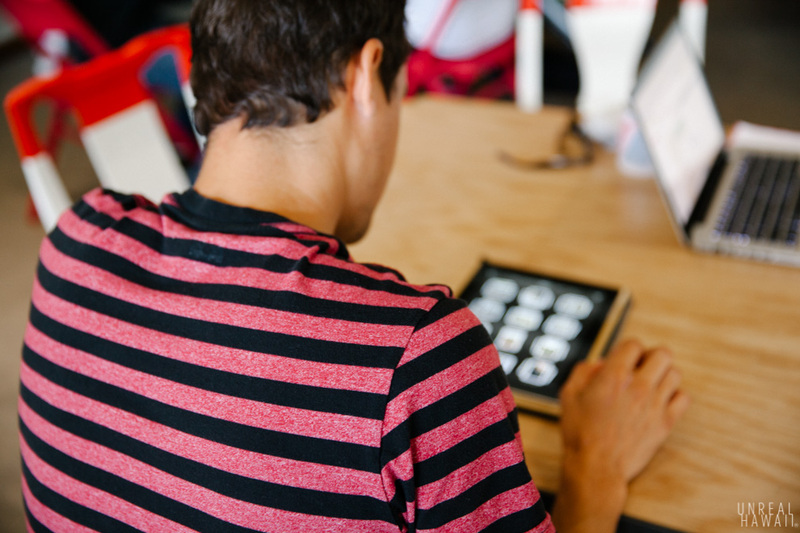 Do not attempt what you see in the photos depicted in this story. This drop goes down a 300 ft waterfall. 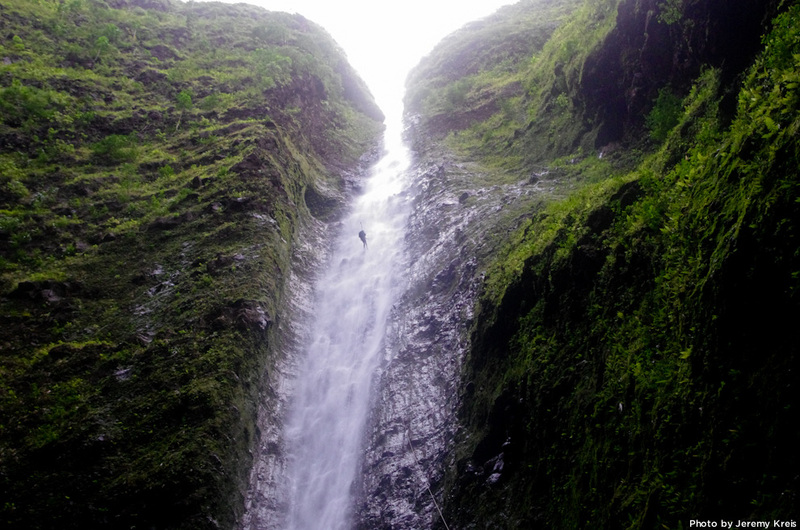 And this is a drop is down a 500 ft waterfall. 500 feet is a long way down. 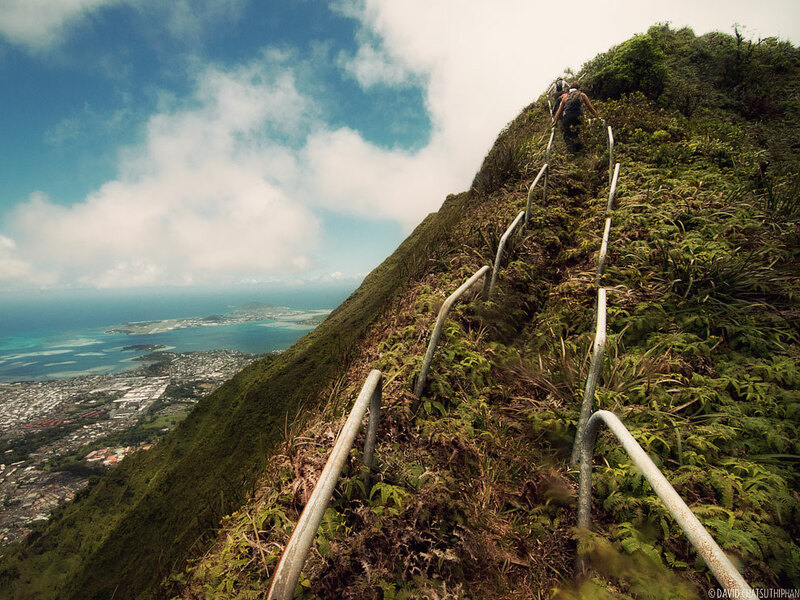 This kind of thing might look unimaginable but people are doing it in Hawaii. It’s called canyoneering. 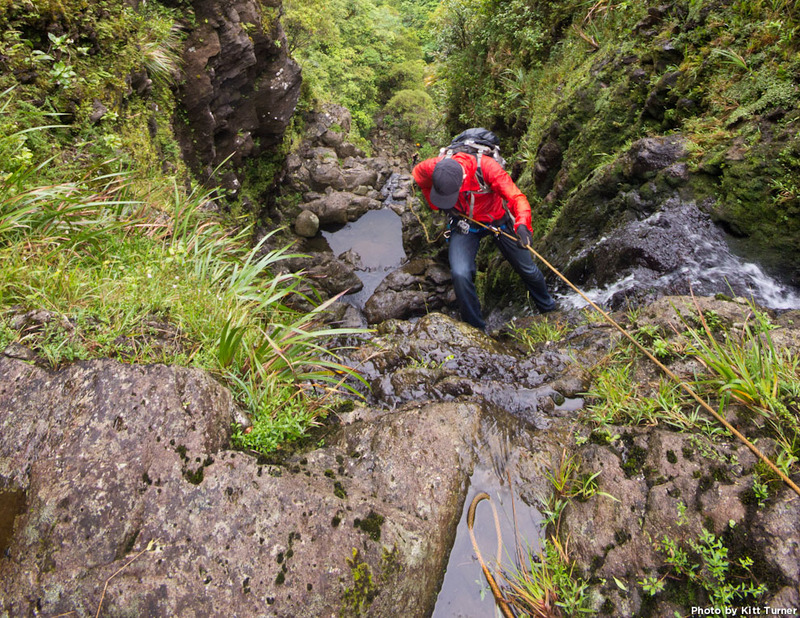 Anywhere else in the world, this outdoor activity is called “canyoning,” but here in the US we saying “canyoneering.” Canyoneering is pretty much the opposite of hiking or rock climbing. The point is to start at the top and work your way down. 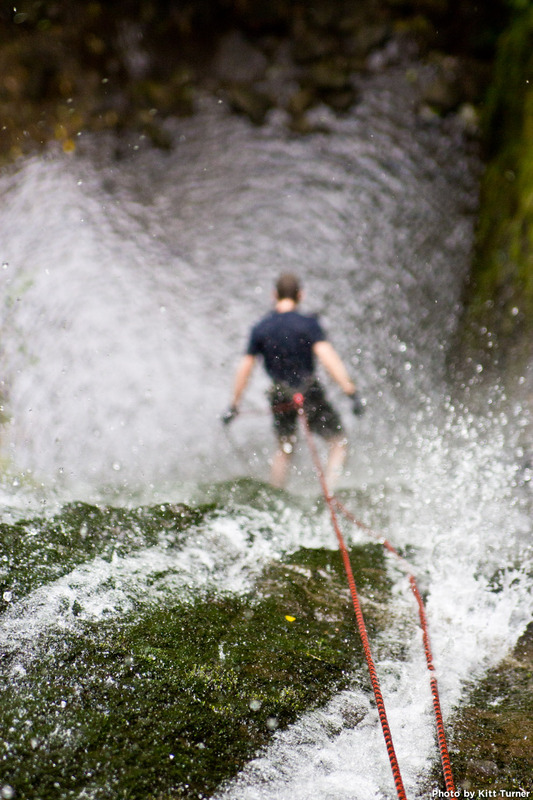 In involves downhill hiking, rappelling and sometimes cliff jumping. It’s all about the descent. Canyoneering is a niche sport. 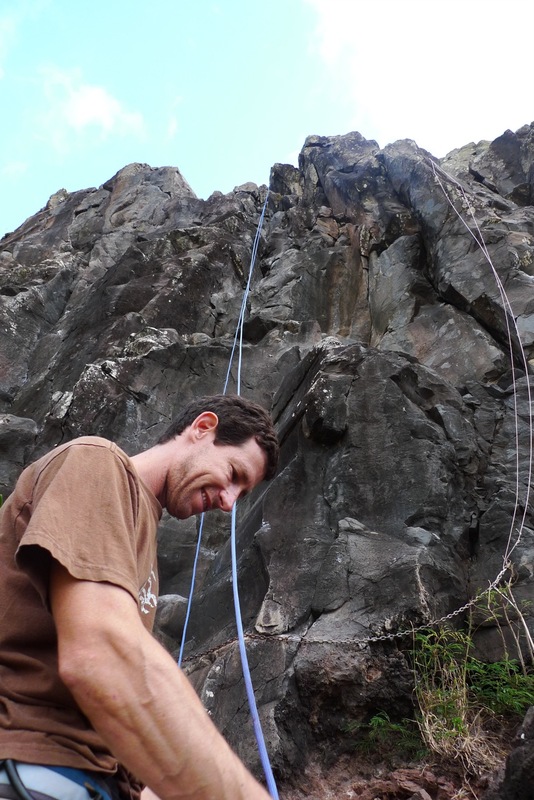 It’s requires very technical rope skills, a lot of expensive gear and … how should I say this … you need some major balls. Because when you take it to the extreme, this stuff can be extremely dangerous. Only a few people (that I know of) are doing it in Hawaii. I’m not one of them. But I did have coffee with a local canyoneer recently to talk about his adventures. Meet Kitt Turner. 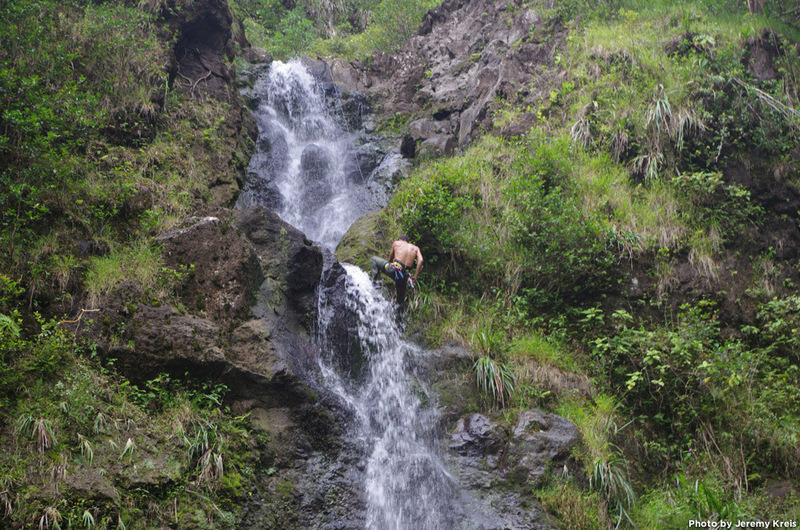 He’s part of a small crew of people who’ve been canyoneering the slot canyons (also known as gulches) on Oahu. The photos that started off this story were from one of his canyoneering adventures. We have some mutual friends in the hiking community and he contacted me recently to see if I wanted to check out some of the photos him and his friends were getting. Kitt is a graduate from UH Manoa and currently works in Downtown Honolulu. 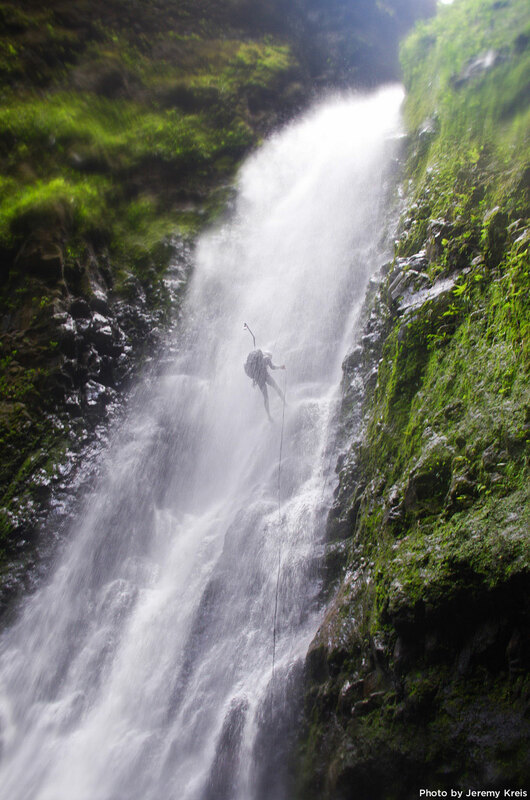 During the week he works in finance and on weekends him and his friend rappel down waterfalls. 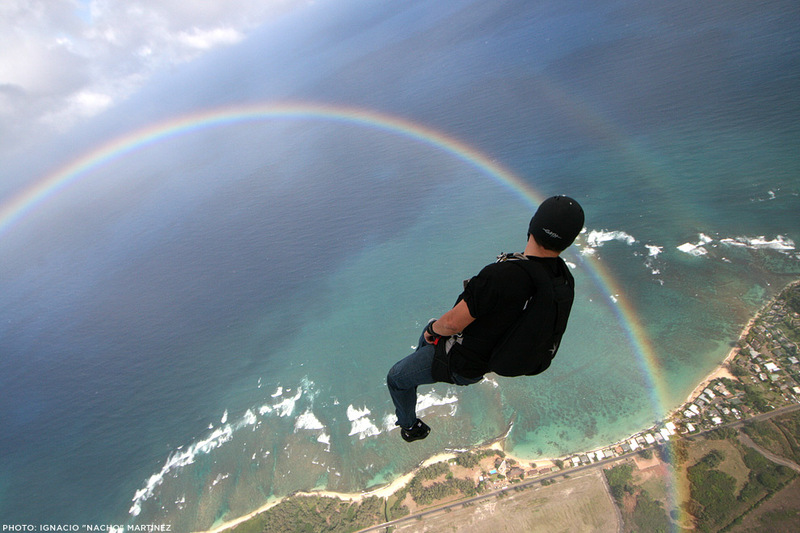 We met at R&D in Kakaako and he showed me photos him and one of his adventure buddies, Jeremy Kreis, had taken. I was a little bit blown away. 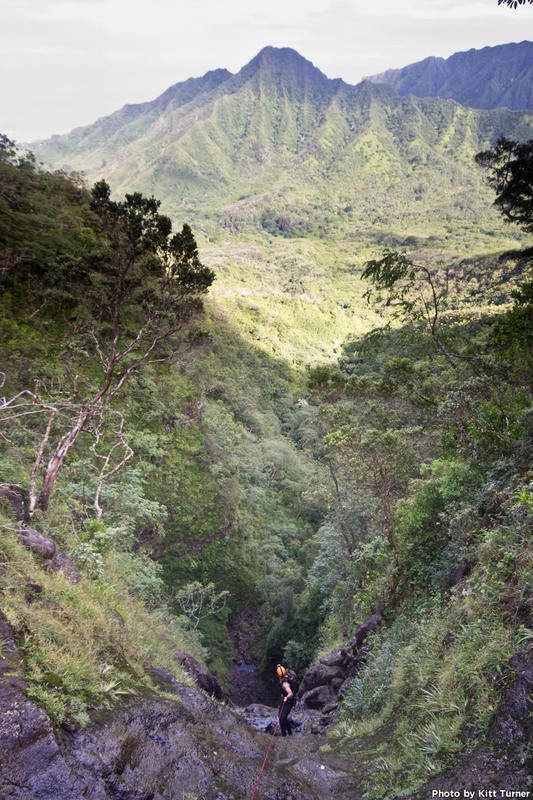 In this story I’m going to share with you a sampling of Kitt and Jeremy’s photos that show the canyoneering spots their crew has established on Oahu. 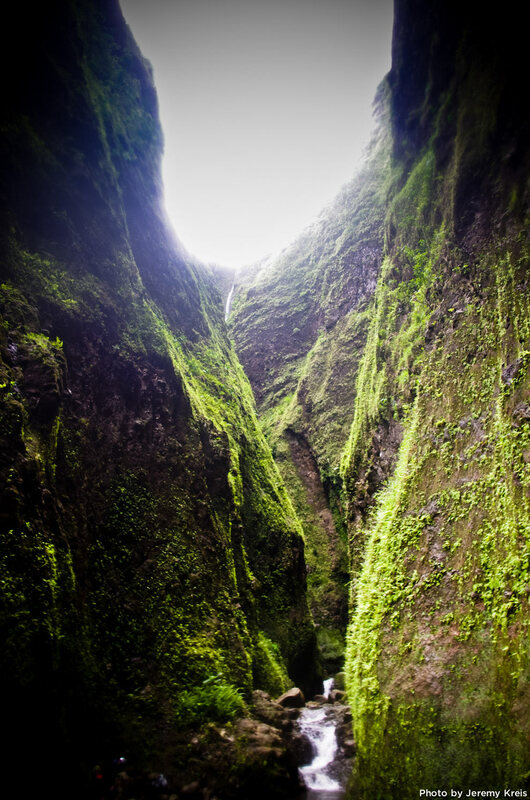 Similar to rock climbing, the first person (or group) to successfully descend a canyon gets to name it. It’s a nickname that only canyoneers will use. Oftentimes, this name will be different than the official name of the canyon, gulch, valley or waterfall they have descended. 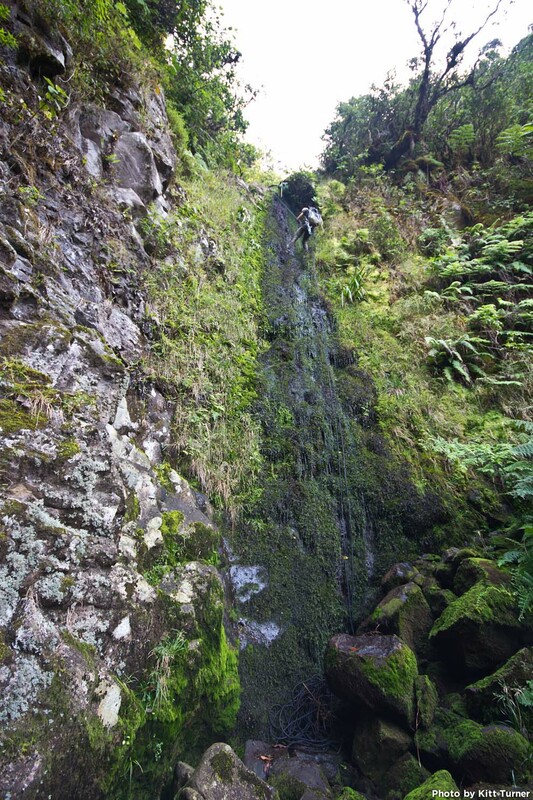 Their first attempt at canyoneering in Hawaii was in this gulch that is currently unnamed among Hawaii canyoneers. (The first group of people to successfully rappel the gulch have not named it.) They had a small group of four people: Kitt, Jeremy, Beau and Kelliann. The waterfall that runs through the gulch it is broken up into 10 sections. 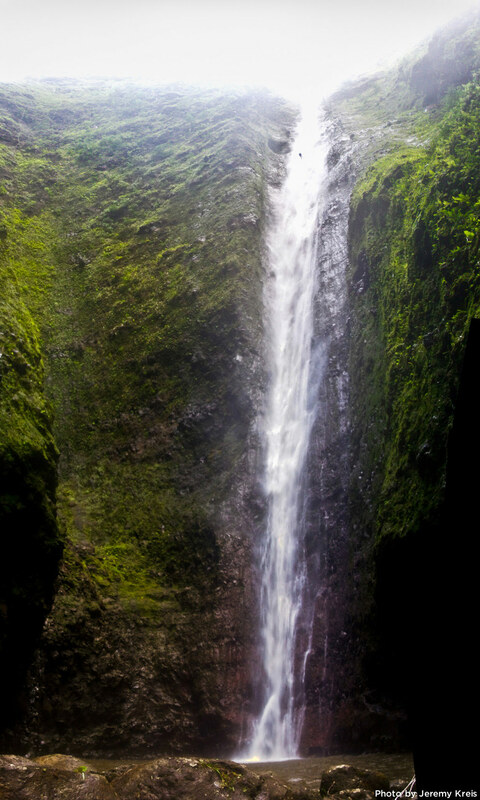 The tallest sections are 500 ft and 300 ft waterfalls. 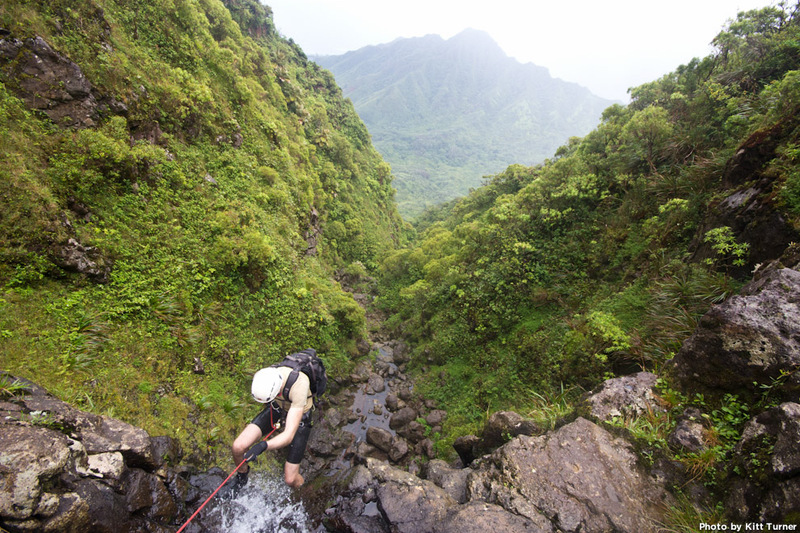 To descend this series of waterfalls, you must first hike to the top carrying a lot of gear (including some 1,200 feet of rope). And actually, before you even can even hike to the top, you must first find top. It took them two scouting missions to figure out the best approach to the top of the falls and plan their route. They could tell that it would take a long time to get through all the sections so they knew they had to start in the early morning. The first rappel is a modest 50 ft drop. 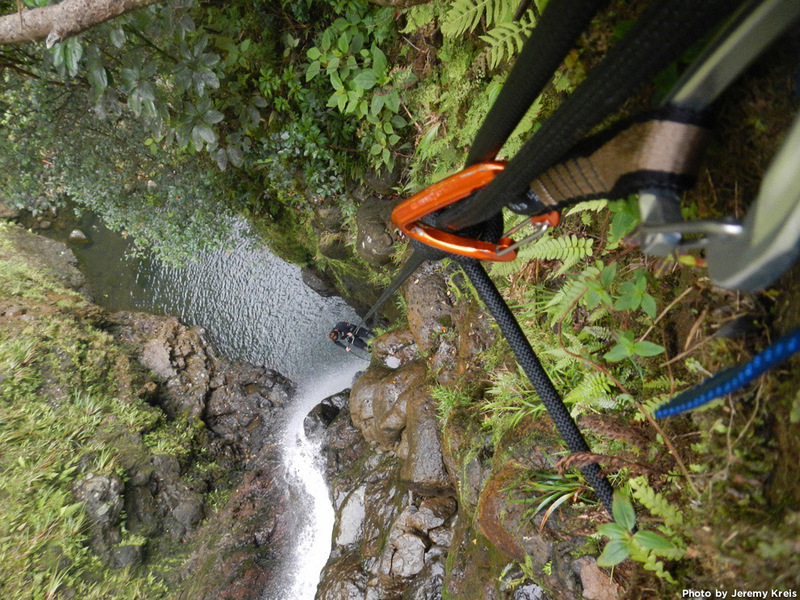 Some rappels were multi-tiered and on some sections, they just jumped into the pool below. 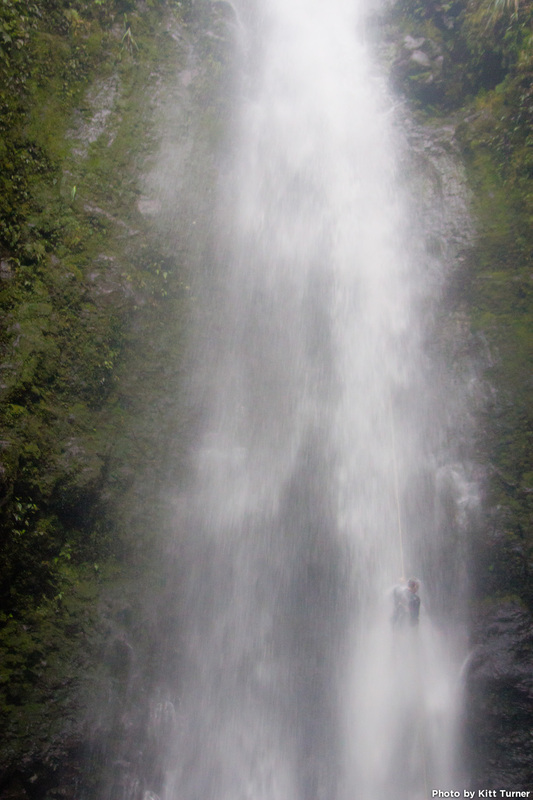 The sixth drop was a 300 ft waterfall followed immediately by a 500 ft waterfall. Now for each of these drops you have to set up your anchors and ropes. 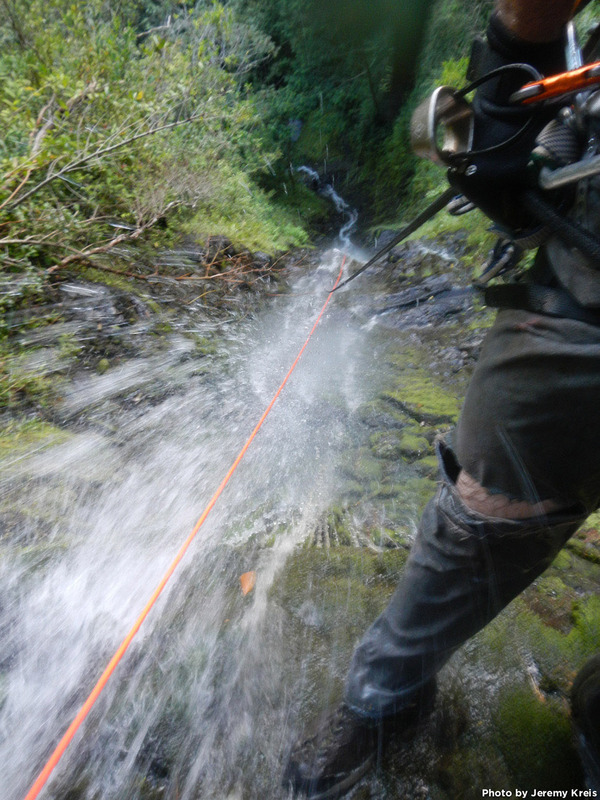 Then you rappel one at a time and at the bottom of each section of the waterfall you have to gather your gear and hike a short distance to the next drop. This is a time consuming process. 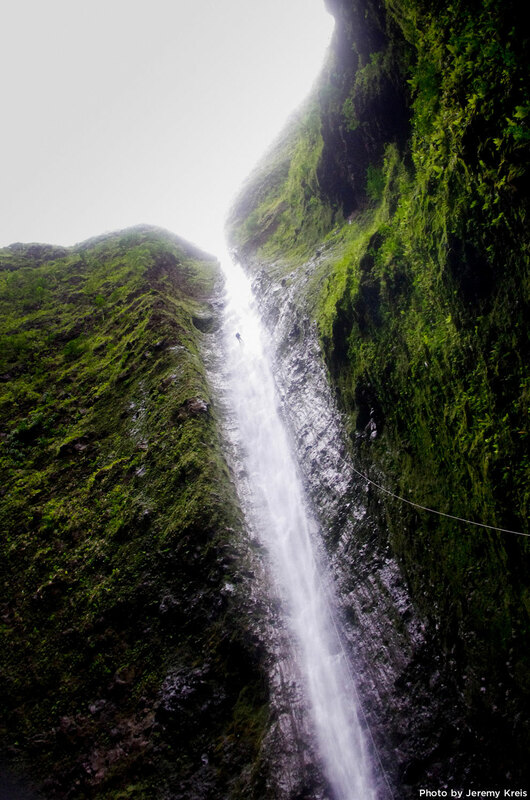 The rappels ended up taking the crew longer than expected and after all four canyoneers had descended the 500 ft waterfall, dusk was approaching. There were still three more drops to do and it was clear that there was no way they could do them all before dark. 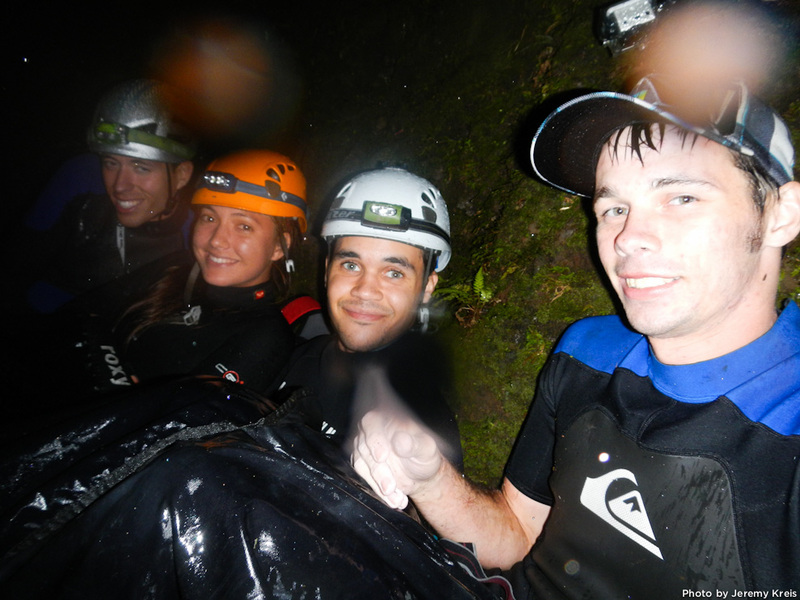 Being that this was their first time canyoneering, they figured it wouldn’t be safe to rappel in the dark so they decided to spend the night near the base of the 500 ft section of the waterfall. Now I don’t know if you’ve ever been at the bottom of a gushing waterfall in Hawaii, but I can tell you it doesn’t feel like Hawaii. It’s a cold windy place. There are typically near vertical valley walls surrounding you forming a “room” of sorts. The wind blows through there like a wind tunnel and there’s mist everywhere. When the water is flowing hard it can sound like a jet engine. So, that’s where these folks ended up staying the night. In a “room” like that on a ledge they found somewhere between the seventh and eighth section of the waterfall. It was pitch dark, raining and cold. One has to imagine that a certain amount of cuddling was necessary to get through the night. The next morning, the crew completed the last drops and hiked out of the gulch. This was their first canyoneering adventure but it wouldn’t be their last. For the last year folks from this crew and several of their friends have rappelled down several other waterfalls on Oahu. 12 Gauge Canyon was established by Kitt, Jeremy, JJ, Chris and Lyzel. 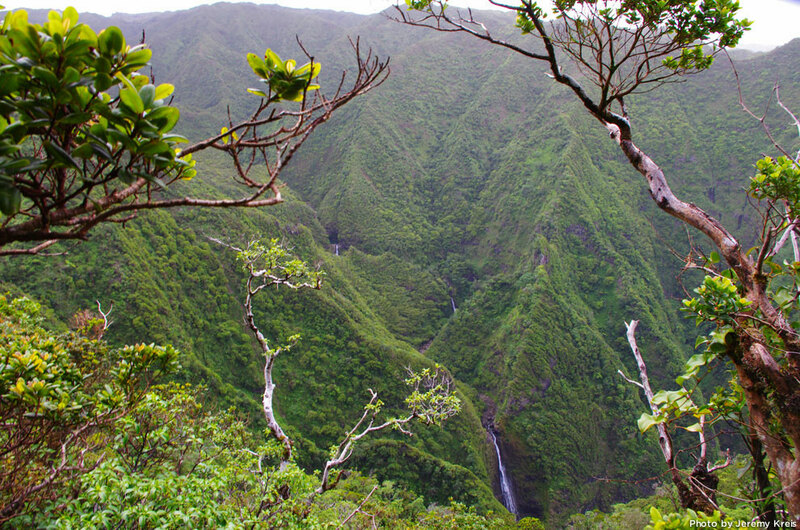 It’s in a valley on Oahu’s east side. 12 Gauge Canyon has 15 drops. The tallest drop is almost 400 ft tall and the trip took the crew 15 hours. This spot was originally spotted by JJ, a former canyoneering guide and instructor in Utah. Looking out into the valley you can see they are a long way from civilization (relatively speaking). 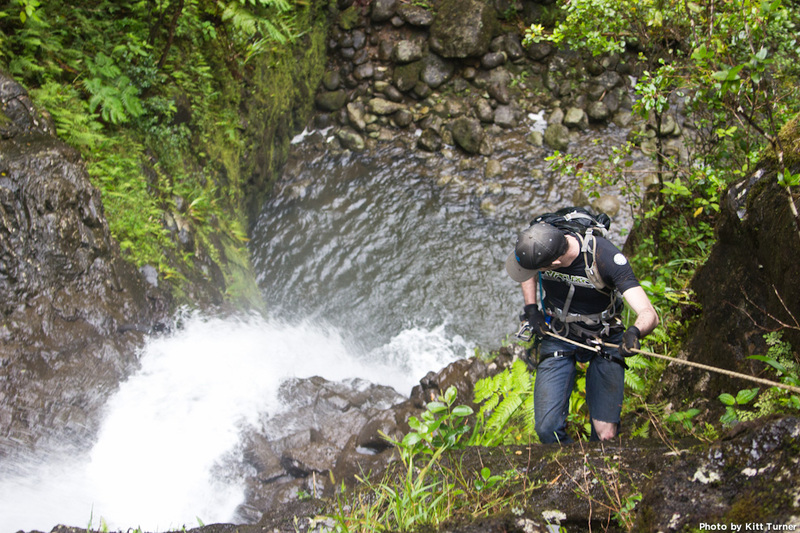 Jeremy descends a two tiered section of the waterfall. The valley looks peaceful in the mist. The water was flowing lightly on this day but those rocks still look really slippery. The crew looks up at the drop they all had just completed. This final drop at 12 Gauge Canyon is somewhere around 360 ft tall. Log Jam Canyon was established by Kitt, Jeremy, Matt and Chris. It’s located in East Oahu and took 16 hours to complete. The name “Log Jam” comes from an anchor the crew had to use on one of their drops. Typically a tree or series of rocks can be found to use as anchors. But on one drop, the crew found nothing to anchor to and had to get creative. 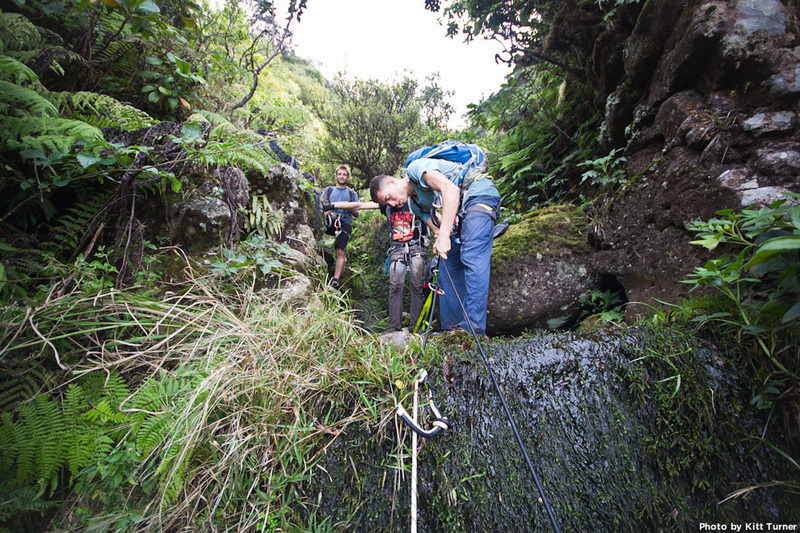 They were in a narrow gulch between two sections of the waterfall and if they couldn’t find an anchor they would be stuck. 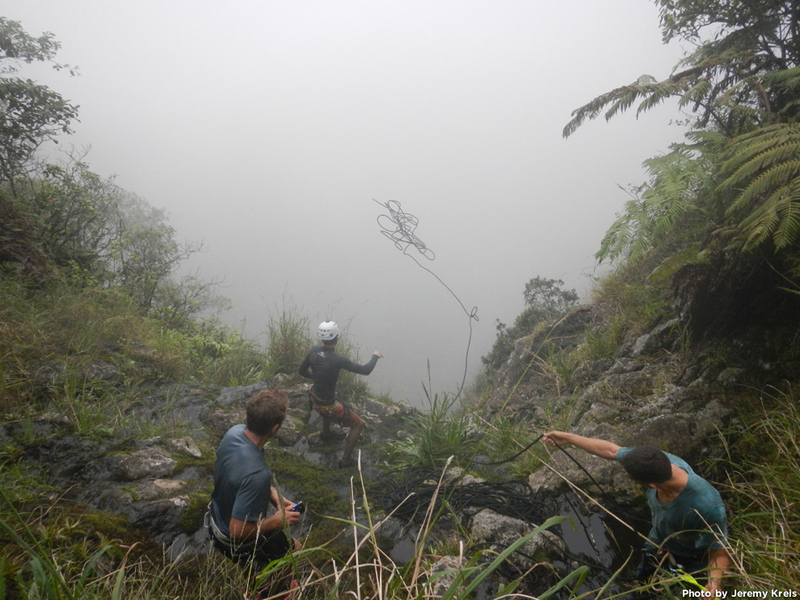 Hiking or climbing would not be possible with the wet conditions and steep valley walls surrounding them. But, there was a 10 ft log lying around nearby. So, the solution was obvious. Jam the log horizontally between the walls of the narrow gulch until it seemed like it wouldn’t budge. Then tie an anchor around it, clip it to your harness and proceed to walk off the cliff. On this day the falls were flowing strong. 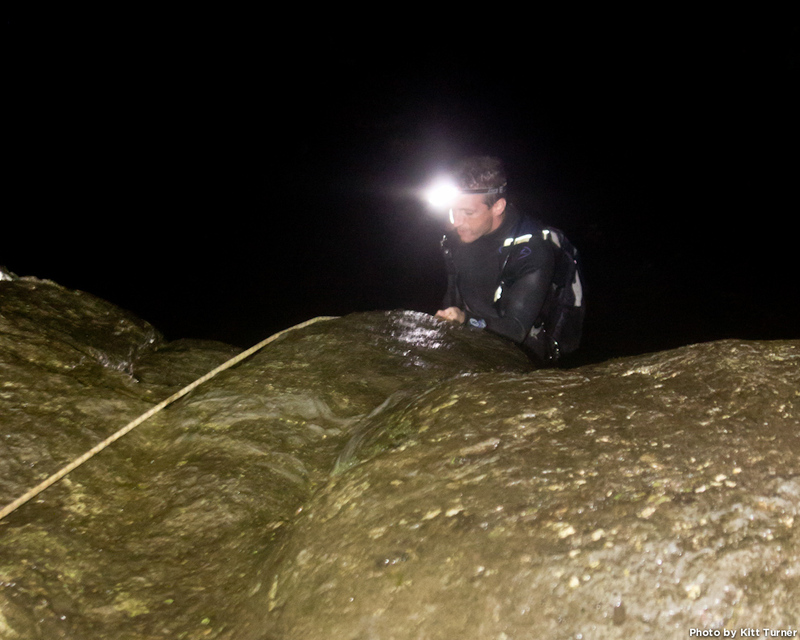 Now that the crew had some experience in canyoneering, they were comfortable rappelling in the dark. They’ve actually done Log Jam Canyon twice and had to drop down the final waterfall (which is maybe 150 ft tall) in the dark both times. So, they’ve never actually seen what it looks like. Stratusphere was established by Kitt, Jeremy, Beau and Matt. It’s located in West Oahu and took the crew 12 hours to complete. 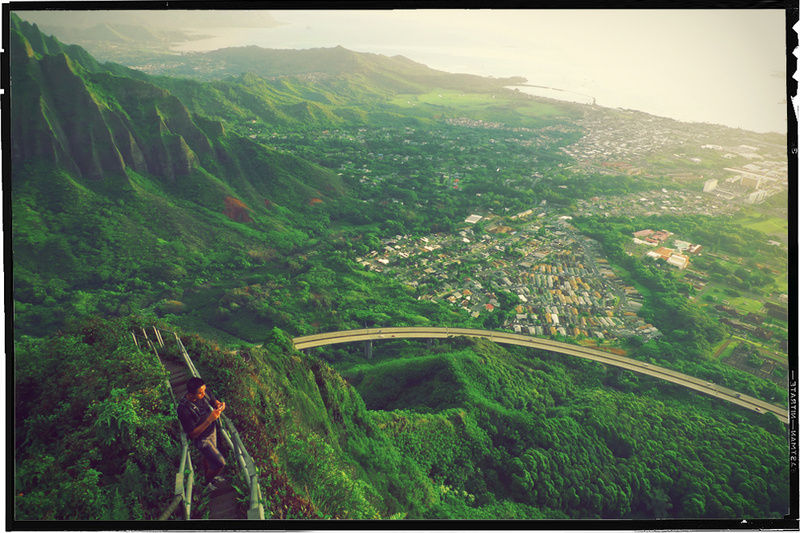 There are some killer views of the Waianae mountains from up here. Here Beau is checking the ropes. 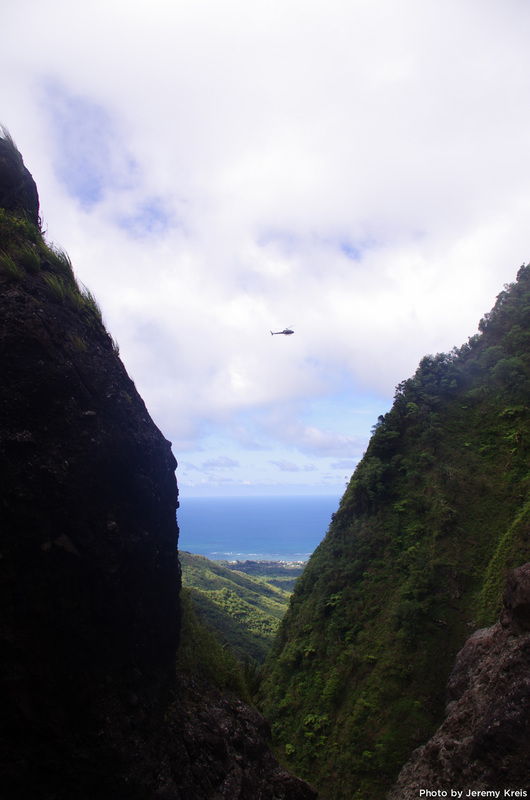 Beau descends with the Waianae Range in the background. Matt takes a drop into the forest. Here’s what that drop looked like from below. Kitt tosses a rope over the last drop as the mist rolls in. 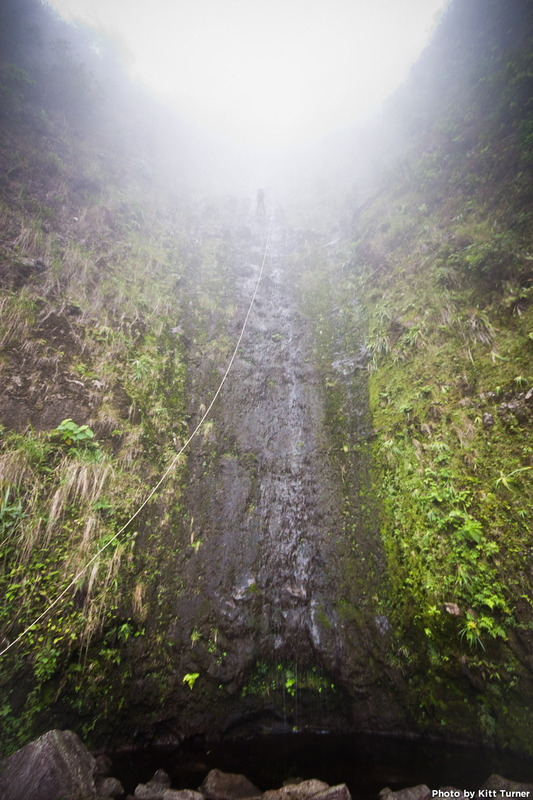 They would rappel down the final waterfall in the mist. 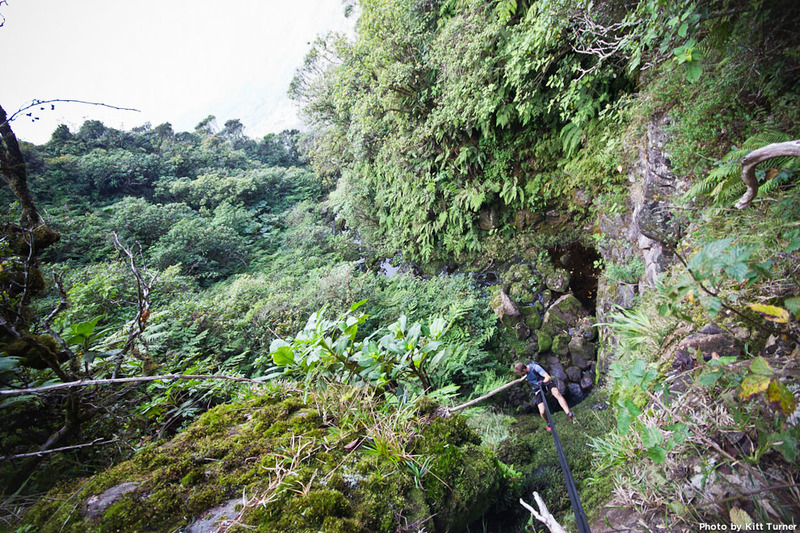 Information about canyoneering spots in Hawaii is out there but the Oahu locations are mostly kept between a small group of people. 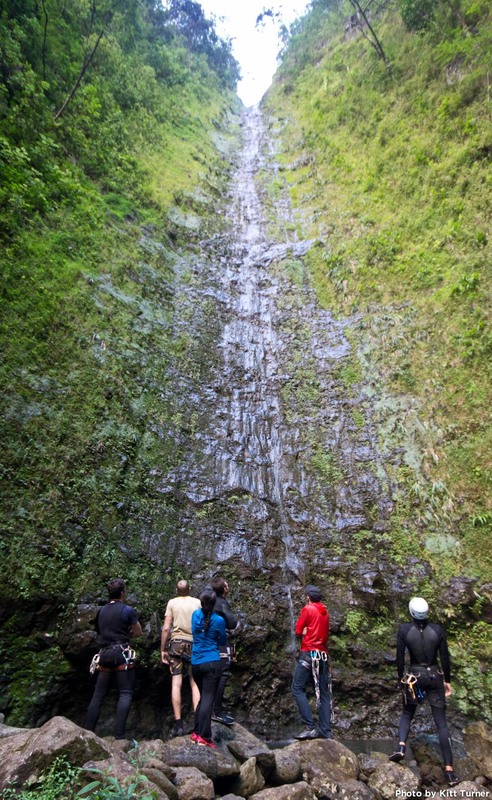 I have heard of other folks doing rappelling and slot canyon exploring here an there (especially on neighbor islands) but so far, I haven’t heard of others that are tackling entire gulches on Oahu like these guys. 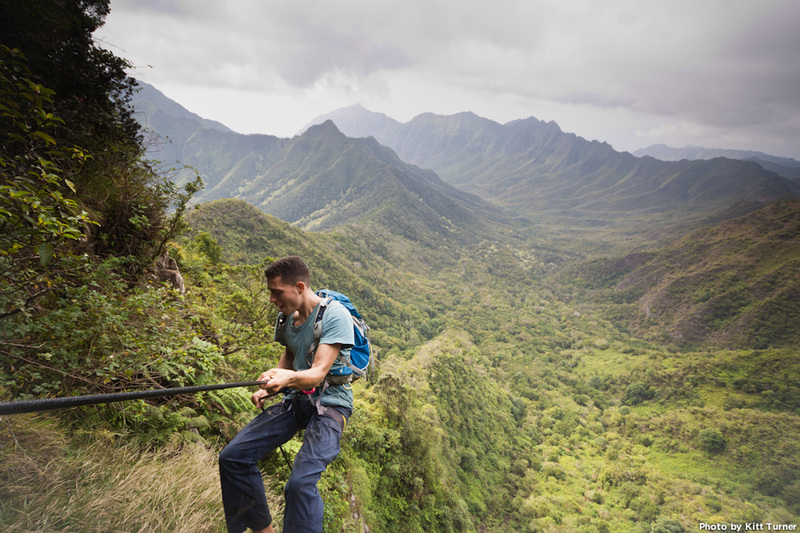 To do what they do you need to be willing to spend a few days scouting (i.e., a lot of hiking) and planning, you need significant knowledge of the Koolau and Waianae Ranges (or you will for sure get lost) and you need to have practiced advanced rope and rappelling skills so that you can improvise in critical situations. 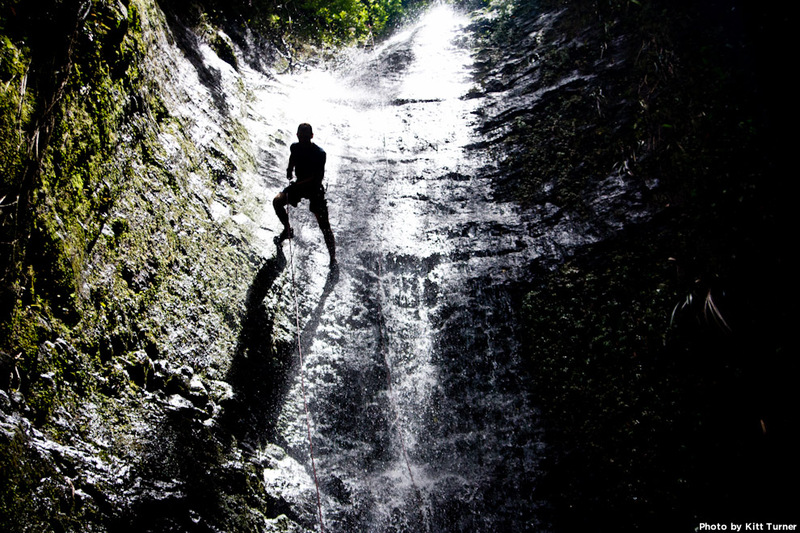 For beginners, canyoneering is best done with a professional guide. 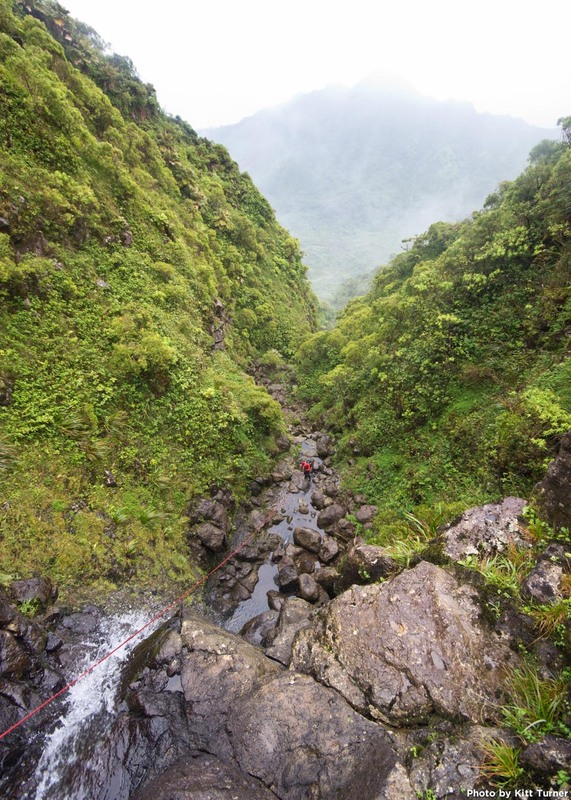 The Canyon Cronicles: Canyoneering Hawaii: Accounts of canyoneering adventures on Hawaii’s Big Island. Bogley Forum on Canyoneering: A discussion forum with canyoneering stories from around the country. 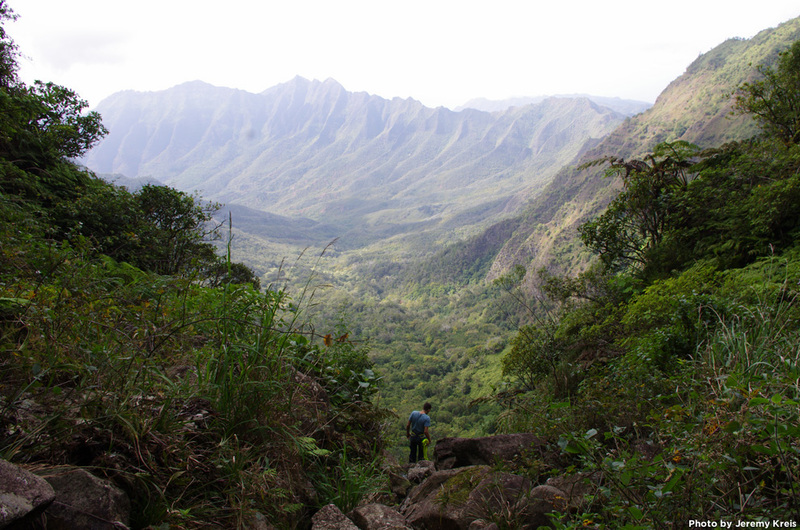 Waialeale Basecamp: Canyons of Kauai: Info on Kauai’s canyon’s and gorges. 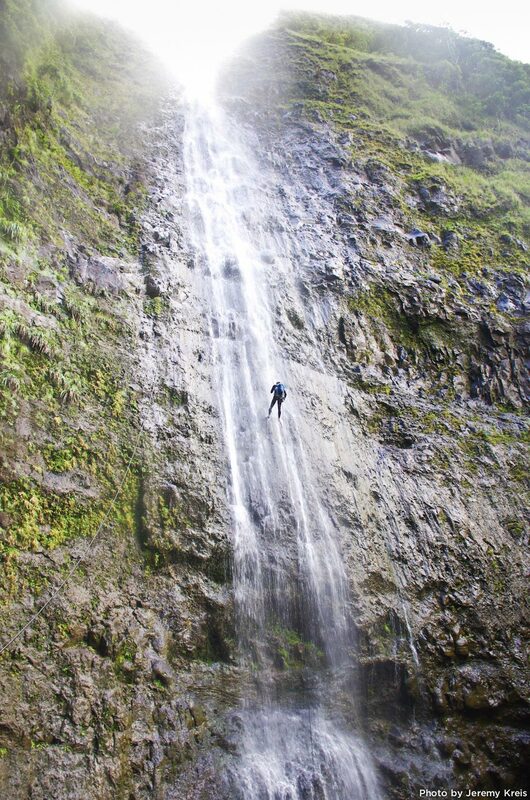 I have heard that tours and guides are available for waterfall rappelling on Maui but since I haven’t tried any, I cannot vouch for them.